Ceiling mount for ropes, solves your space issues. Ensure your plates are always on hand while you work the rack. Easy to move thanks to the quick release pin system. Ideal for storing fractional or Olympic plates on your modular shelf. Also use to store collars. 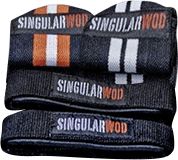 The Singular WOD ceiling mount for rings is here to meet the needs of boxes and individuals who don’t have the option to attach their rings to the structure. Bar holder for placing bars vertically. Brackets to safely anchor rings or ropes to your unique WOD structure. Require a perforated arcade for installation. Mount for placing Olympic bars. Available for collapsible racks, power racks and double power racks. Ensure your plates are always on hand while you work the rack. Easy to move thanks to the quick pin system.